Santa gets HOT when wearing his suit! Please make sure that your inside location isn't overly warm or even hot, and that Santa's chair isn't placed in front of a lit fireplace. If possible, have a small fan available to help keep Santa cool during his appearance. 1. Make sure that all your cameras and video equipment are charged and ready to go. 2. Make sure that Santa has a parking spot that is close by the event. 3. 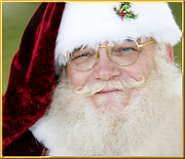 If you have gifts or items to be handed out, Santa is more than happy to do so. Please have gifts well marked with printed names that are well taped to the package, or better yet, printed with a bold marker right on the package in a legible color, as tape can fall off. All gifts should be able to fit into one large 35-gal trash bag, making sure that the bag can be lifted. If more than 1 bag is required, please talk to Santa ahead of time. Perhaps a “helper” can be arranged to bring in the other(s). 4. Make sure that everyone is there prior to Santa arriving. You can arrange to have Santa call you when he is 5 minutes away, so that you can get everyone ready. 5. Have a sturdy chair for Santa to sit in. A straight back dining room style chair without arms is a perfect choice. Please nothing with wheels! 6. Place this chair near your tree or wherever you want so as to get a nice background for the pictures. Leave enough room for people to also stand behind the chair. 7. Santa also prefers NOT to be around cigarette or other smoke as it smells up his suit for other visits. 1. Again see numbers 1, 2, 5 & 7 from the Home Visits section. 2. ALWAYS address Santa as Santa! 3. Know where everything is at the facility beforehand (restrooms, etc.). 4. Depending upon how long Santa is scheduled for, a break area for Santa may be needed so that he can change in/out of his suit and take a break. Please have cold water available. 5. Santa may need a fan and water as well. An indoor event can get very warm and crowded. As Santa is wearing a heavy suit, he can get over heated. Having a small fan placed near where he is to sit and aiming at his upper body does wonders. 6. Santa needs hourly breaks - 10 minutes for every 1 hour sitting. Work this out prior to the event. And if Santa is walking around and standing at the event, additional breaks will be needed. Again, discuss this with Santa prior to the event. 7. Have a way to control the crowd with a line of some sort. Assistants or helpers are a good idea. 8. Santa will NOT lift, handle or carry any child. Parents should take their child to Santa, or place/remove a small infant from Santa’s arms. 9. Make sure that all faces and hands of the kids are clean and not messy/sticky. Have a batch of wipes available along with a trash container nearby. 10. Keep the line moving. Some will want to take lots of pictures - assuming a professional photographer is not present and/or this is allowed. But just because their camera can hold 200 pictures doesn’t mean they can tie up the line. *These copyrighted guidelines are based on the helpful hints of Santa Tim Connaghan.